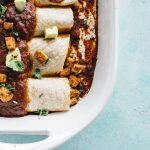 These vegan enchiladas are loaded with spicy tofu, black beans, diced tomatoes, and avocado for a healthy, flavor-filled meal. Pour tofu out on a plate and use a dish towel or several paper towels to soak up the moisture. I ended up using a dish towel plus two paper towels and pressed down on the tofu for a few seconds at a time. You want most of the moisture out but it’s ok if you don’t get it all. If you own a tofu press, use that instead. Transfer the tofu to a large skillet and add olive oil and taco seasoning. Cook tofu on high heat for 10 minutes or until tofu is crispy. While tofu is cooking, combine tomatoes, black beans and onion together in a bowl and set aside. In a separate bowl, stir the marinara sauce and chipotle seasoning together and set aside. Take 1/2 cup of the sauce and pour it into a large baking dish (mine is 9.5×13), using a spoon or spatula to spread the sauce all over the dish. When the tofu is done cooking, add it, along with 1/2 cup of the marinara sauce, to the bowl of tomatoes and stir. To assemble the enchiladas: scoop 1/3 cup of the tomato mixture into one tortilla. Roll the tortilla and put the fold side down into the baking dish. Repeat this process until all enchiladas are assembled. Pour remaining sauce and diced tomato mixture overtop of the enchiladas and bake for 15-20 minutes. Add avocado to enchiladas before serving, and enjoy!